Kids… The funny things they say and do. Yes, well I guess EVERYONE has by now heard about the meteor that entered the earth’s atmosphere and exploded over Russia in February this year. If not, here are some links for you. Now, this alone really freaked me out considering what I have read and believe about Biblical prophecy about lots of strange weather events happening in the last days. And boy, are they happening!! My entire 2013 has been full of synchronous events thus far. After this one this morning, I had to decide to start posting about the more important, or “big” ones. Why do we experience so much doubt? (1) Because doubt satisfies our need for selfprotection We don’t like to be wrong, to get hurt, or to fail, so our subconscious reasoning says, ‘It’s easier not to trust, to lower my expectations so I won’t be disappointed.’ But you are disappointed, aren’t you? Why? Because of your doubt. (2) Because doubting comes easily We don’t wake up in the morning and say to ourselves, ‘Today I’m going to doubt God.’ No, doubt moves into a vacuum; it takes over when we don’t do the right things. ‘…Faith comes by hearing, and hearing by the Word of God.’ (Romans 10:17 NKJV) If you don’t keep your mind filled with God’s Word; you’ll be constantly assailed by doubts. (3) Because doubters are easy to find. Sometimes the people around us dwell on all the obstacles and difficulties, opening the door to doubt. And once that stream starts flowing, you get carried along with it. (4) Because doubting is contagious Doubt is easier to catch than the common cold, and its carriers are words. The Bible says, ‘You are trapped by your own words.’ (Proverbs 6:2 CEV) The words you speak (and listen to) will either build you up or tear you down, increase your faith or decrease it. For example, ‘What will I do?’ versus, ‘In God’s strength I can handle it.’ Or, ‘It’s awful’ versus, ‘It’s a learning experience.’ Or, ‘I see no way out’ versus ‘It’s not too big for God.’ Words are powerful things. They determine your outlook and approach to life. So in order to move from doubt to faith you must start eliminating unscriptural words from your life! Some great Classic Rock Lists. We held Dad’s funeral on Monday afternoon. It had been raining for days beforehand, so I prayed and asked for the rain to stop on Sunday night and for it to be a fine day on Monday. Monday was a beautiful, warm, sunny day. One short, sharp shower came over not long after we had placed Dad’s casket into the hearse, and it was like a cleansing shower from God, washing away all the tears and pain. Strangely, I cried my eyes our before and after I gave the Eulogy, but I stayed tear free during. As Dad was a War Veteran, we included an RSL service. It was lovely. The entire funeral was lovely. We included quite a few laughs in it, and I even had some of my cousins calling out reminders from the pews. It was good. We all have to face death don’t we. Whether it be someone we love, someone we know, the truth of our own mortality… We feel the loss of the familiar and it scares us. I think there would be only a small minority of people in the world who could truly say that death and dying didn’t scare them. I’m a Christian, I believe that when my earthly body is done here, I’ll enter into eternity to be with my Lord and Saviour, Jesus Christ. But I am still scared of dying. I believe that is because I am hanging on too tightly to the things of this world – things that don’t last. I pray that will change and I will be prepared to let go of the material in order to grasp hold of the eternal. I sent my Daddy on his final journey yesterday afternoon. Dad’s funeral went well, or so I’m told. I wish that I would have gotten around to see everyone who came to it before it started. Jack and Lou and Tina Rock were there. My cousins Teena and Bob Bryant drove down from Rocky at 4am that morning. Peter and Mook and Karen were there. Nana Joyce, Toby, even Rick came. Margaret Cook (nee Jacobi), Dad’s cousin was there. Kylie from Deane’s work was there. And so many more. 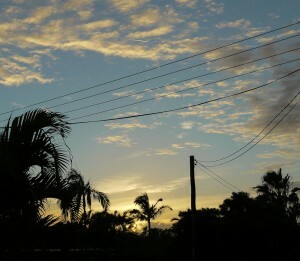 This morning I went to take photos of the sunrise and the clouds. To my naked eye I could not see this, but through my viewfinder I saw a face. And then another face. Two different faces. I haven’t checked my photos yet, because I am scared that I might find that it was a mark on the lens and not real faces in the clouds. But I saw them when I was taking the photos, so that is enough for me. Rest in Peace my Daddy. I love you and will miss you always. Dad had been living in a nursing home – Tri Care at Point Vernon in Hervey Bay – for the past few years. Before that, he lived most of his later years in a caravan in Caravan Village in Aspley in Brisbane, Qld – both under the care of my Mum, and then after her passing in 1995, independantly. He took the latter option – Lou wouldn’t have it any other way. She had been helping to care for both her Nana and Grandad while they lived in the caravan, taking them to buy their groceries and all that sort of stuff while they could, then doing it for them as time went on. My Dad lived with Lou, and her then partner Jay, and their two girls for a few years. They lived in the same suburb, a few blocks away from the caravan park. It was good. The girls, Cylah and Halle, loved having their Grandad there. After a time, Lou and her partner separated. Cylah, their oldest daughter went to live with her Dad. She was a real Daddy’s girl. They moved to Maryborough, Qld. Not too long after, Lou could no longer stand being away from Cylah, so she and her new partner, Halle and Grandad all moved to Maryborough as well. Dad continued to live with Lou for a few more years, until his care became too much and she had to find somewhere for him that was able to offer the care that she couldn’t. That is when he moved into Tri Care. Today is the first day without my Dad. He passed away yesterday afternoon, Wednesday 14th March, 2012. He was 94 years old. He would have turned 95 in 29 days time – on the 12th April. He had a fall on Friday 9th March 2012, and cracked his right hip. I didn’t find out about this until 9am Saturday morning when Lou came over to our house to let me and my husband Deane know that he had been admitted to the Hervey Bay Surgical Ward sometime on Friday evening/night. I immediately phoned my son Mark and the four of us went to the hospital to visit him. That was the last “normal” day we got to really spend with him. He was obviously in pain, but he was able to talk to us, hold our hands, and look at us properly. He was still pretty much the same Dad and Grandad. He had a chest infection tho, which the doctors thought may have even caused him to fall, and so they were giving him antibiotics to try to clear that up. The orthopedic surgeon and the anaesthetist had been considering surgery to put pins in his hip in order to lessen the stress that the fracture was causing to his body, but with the chest infection not clearing up, it was a will they/won’t they guessing game for a few days. Unfortunately, the stress of the fracture was taking it’s toll on his body, and it became obvious from Sunday afternoon that his body was failing and that he probably would not recover from it. I couldnt’ believe how different he looked from Saturday morning to Sunday afternoon. Massive, massive change. He could no longer talk to us, he could barely squeeze our hands, he was deteriorating before our eyes. I had the prayers of many friends going to God’s ears on Dad’s behalf, and Dad hung on night after night. The Doctors were actually amazed each morning that they did their rounds to find that he was still with us. When Lou and I visited him on Tuesday morning, he was sleeping and he looked so peaceful and pain free that we knew immediately that we could not put him through the trauma of surgery. The anaesthetist, a gorgeous young woman, came to see us while we were there with Dad, and she went through everything with us. Dad was now suffering renal failure (failure of the kidneys), as well as respitory failure. Surgery would not be an option. His body was working extremely hard just to take his next breath. The anaesthetist said that if there were any other family members who wanted to see him, then they should do it as soon as possible. I went outside and phoned Chrissie. She drove up from Brisbane that night and we – Lou, Chrissie and I – all went to visit Dad on Wednesday morning. We talked to him, held his hands and got carried away with our usual silly, chatty behaviour amongst ourselves. After a little while we went to the cafeteria to have lunch. On our arrival back at Dad’s room, we saw that he had passed. He was still warm and when the nurse who had been caring for him came in a little later she said that she had been in to see him 15 minutes before we arrived back, and he was still with us. I truly believe that he waited until his whole family had come to see him before he knew it was time to go. I will be ever grateful and thankful for my Dad. I will be ever grateful for Lou taking care of both him and Mum. I will be ever grateful for the love and support of my husband Deane, and for the love of my family. I will be ever grateful for the prayers offered for our family by so many. I will be forever grateful to the hospital and paliative care team who looked after him in his final days. And I will be ever grateful for Chrissie coming to see him that one last time. Today is a new day. My first day without my Dad. Rest in peace my Daddy. I loved you. Released 12 November 2009 in Australia, I finally watched this on DVD in August 2010. Wow… What a movie. As creeped out and uncomfortable as it left me in places, it is the epitome of what happens to the human soul when we allow deceit, lies, and falsehoods in. If we think we can do whatever we like without consequences, then we are sorely mistaken. Poor Dorian (Ben Barnes). He arrives in Londen at 20 years old to inherit his family home. He is filled with wonder and all is good until the first meeting with Lord Henry Wotton (Colin Firth), pretty much as soon as he walks through the door. Lord Henry begins to fill Dorian’s head with thoughts of “it’s ok to enjoy life, don’t feel guilty about it” and continues to push him to do so throughout the movie. He is sending Dorian down the path of self destruction, patting him on the back all the way. Dorian had his portrait painted shortly after his arrival to London, and while Dorian stays forever young and seemingly unscathed by his debaucherous lifestyle, the portrait shows the effect that the sin filled life is really having on his soul. In the end, Dorian realises that he cannot go on this way and tries to “change” and become “good” again, but things have gone too far and now there is only one way out. I rate this movie 9/10.